US company wants to bring free wi-fi to 100% of world: mark of the beast technology? I enjoyed Rapture Ready editor Terry James's essay this week called Tribulation Technologies Tightening. The title is evocative, isn't it? Mr James said, "Things are progressing so quickly in the area of people-control technologies that I must admit I simply can’t keep up." For it to come to fruition, first, there must exist some sort of tracking and identification technology that the antichrist and false prophet can even begin to catch up to and track each person, "everyone", in order to force them to take the mark. Second, there must be some sort of technology in place that tracks financial purchases at every point of sale so that people without the mark will be banned at that point of sale from buying anything. And how will the whole world gaze at their bodies for three and a half days, the mews getting around so fast that people have time to go out and buy and exchange gifts? Television. Satellite. Cell phones. But even then, there are many places in the world where people don't have electricity, or tv's or cell phones or cell phone coverage. Additionally, countries like China and North Korea have censored online activity, denying their citizenry the opportunity to view and participate in world news. "There's really nothing that is technically impossible to this." "[O]ne ambitious organisation called the Media Development Investment Fund (MDIF) is planning to turn the age of online computing on its head by giving free web access to every person on Earth. 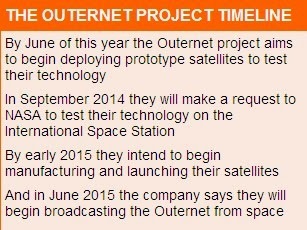 Known as Outernet, MDIF plans to launch hundreds of satellites into orbit by 2015. And they say the project could provide unrestricted Internet access to countries where their web access is censored, including China and North Korea. Using something known as datacasting technology, which involves sending data over wide radio waves, the New York-based company says they'll be able to broadcast the Internet around the world. The Outernet team claim that only 60% of the world's population currently have access to the wealth of knowledge that can be found on the Internet. This is because, despite a wide spread of Wi-FI devices across the globe, many countries are unable or unwilling to provide people with the infrastructure needed to access the web." Well, the so-called outernet would certainly take care of the problem of 40% of the world not having access to instantaneous news, wouldn't it. In other news I've been amazed at the speed with which America has declined. I was born in 1960, at a time when there was the gold standard, US astronauts zooming to the moon and back, winning the cold war, beating the Russians at Olympic Hockey, and being the world's sole superpower. Nothing was impossible and it seemed like the US could and would go on forever. That was an illusion, as the 2007-2008 economic crash showed us. The National Review has a good article on the US decline. America unravels at an increasingly dizzying pace. America is unraveling at a stunning speed and to a staggering degree. This decline is breathtaking, and the prognosis is dim. For starters, Obama now rules by decree. Reportedly for the 27th time, he has changed the rules of Obamacare singlehandedly, with neither congressional approval nor even ceremonial resolutions to limit his actions. Obama needs no such frivolities. “That’s the good thing about being president,” Obama joked on February 10. “I can do whatever I want.” In an especially bitter irony, Obama uttered these despicable words while guiding French president François Hollande through Monticello, the home of Thomas Jefferson — a key architect of America’s foundation of limited government. In my personal opinion, having been an active and acute observer of American life and cultural mores for 50 years, the end is near. I am daily amazed at the implosion of just about every aspect of both American and global life. The decline of morals, the persecution of the Christian religion (higher now than ever in history), declining economy, craven entertainment, unscrupulous personal and governmental finances, rising lack of conscience, the emergence of technologies, church tares over-running the pews, extreme weather, geo-political collapses (Kiev anyone? ), natural disasters, all occurring at once and so constantly, and with ever increasing extremity, all serve to show me and perhaps you too that truly the end is near. The Lord has given his world 2000 years to heed the words of Messiah. What a gracious and long-suffering Savior we have. He said that He would build His church and that when it is complete the rapture would come and He would then turn His attention to finish the transgression of Israel. (Matthew 16:18, Romans 11:25, Daniel 9:24). I believe the time is short to repent and become folded in to the beauty and certainty of the Lord's church. He will whisk His bride home and then unleash the worst wrath and times upon the earth that ever was or will be. (Matthew 24:21). Please heed these things. Please, please repent. Yet, the rapture ~ going to be with Jesus FOREVER ~ is the one thing I live & long for!! More than that, similar to what you recently wrote yourself, I anticipate the day when Jesus will RESTORE all things! Sin, sickness & decay (and certainly death!!) ~ will be a thing of the past!!! No more sorrow; no more goodbyes. No more stray animals or people who harm/abuse animals, kids, spouses, elderly.... they'll all be safe forever. I'm as giddy as a bride-to-be today!! Just knowing ANY MOMENT NOW, our Groom is going to swoop us outta' here!! I share your excitement! We know that if nothing else, we are one day closer to rapture than we were yesterday! I have been feeling the same way for a couple of years. Last time I flew back to the midwest to visit family, I sensed that would be the last time. Everytime I get an oil change for the car I feel that might be the last time it will be needed. Last Christmas, I felt that it very well might be the last Christmas to enjoy the old Christmas hymns. Another Christmas might not come around. Lifelong hobbies no longer mean anything to me, and haven't for years. Just so many ways the Lord is separating his people from this world. That outernet project is diabolical! ... Yet like the above comments, the thought of it coming to pass is eerily exciting! We long for The Lord's return, but mourn for the ones who do not know Him.